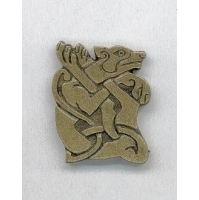 The Duleek dog pendant is based on a design found on the North Cross , Duleek Co. Meath Ireland. Animal patterns of this type were often used to adorn works of art such as the Book of Kells and the high Crosses of Ireland. This pendant is 33mm x 27mm x 5mm in size.The pendant is available in three finishes,brass,bronze and pewter. Please specify which finish is required when ordering.